Cold case playing cards are an ingenious new way of cracking unsolved crimes. 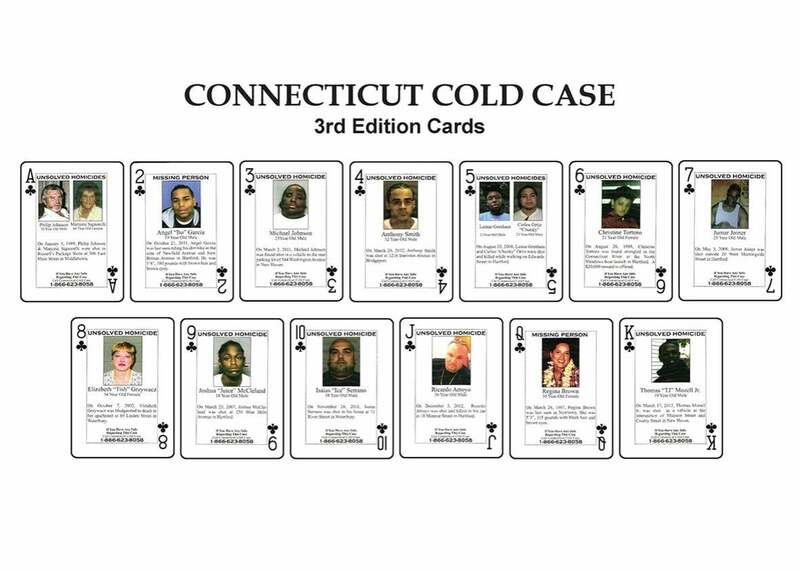 Cold-case playing cards for prisoners have helped solve several crimes in Connecticut. By the time the tip came in, five long years had passed since the night Derrick Comrie was killed. The 20-year-old from Hartford County, Connecticut, had been at a high school basketball game in January 2006, passing out flyers for a party he was throwing a few days later. After the game, Comrie was sitting in the passenger seat of a friend’s car when a man walked up to him and shot him in the face. Afterwards, all the police could say about the killer was that he had braids in his hair and was dressed in a puffy black coat with a fur-lined hood. Comrie’s murder remained unsolved for years thereafter. Then, one day at the end of 2010, authorities received a tip from someone who had heard about the case while serving time in a Connecticut prison. The inmate had been playing with an unusual deck of cards he had purchased from commissary when he saw Comrie’s face—printed, along with the basic facts of his case, on the nine of clubs. Realizing he had once heard a fellow inmate talking about shooting Comrie, the tipster called the free hotline number that was printed along the bottom of the card and told the authorities what he knew. Last July, as a direct result of that phone call, Comrie’s killer was sentenced to 37 years in prison. The playing card that set this chain of events in motion was produced as part of an experimental effort by Connecticut law enforcement agencies designed to generate leads in cold cases. Starting in 2010, the Department of Corrections has distributed thousands of these special decks to prisons throughout the state, with the hope that inmates will see them, experience a flash of recognition, and come forward with information. To date, the cards have generated some 600 tips, and while many of them have proved useless, enough have resulted in breakthroughs that the program is considered a success; last year, Connecticut Chief State’s Attorney Kevin Kane said the cards had “led directly or indirectly” to nine cold cases being solved since the program began. Authorities in Florida ended up solving three murders in three months after the program was introduced. The first of these involved the death of 37-year-old Thomas Wayne Grammer, a methamphetamine dealer who was shot in his home in 2004 during a robbery. An inmate in Polk County told investigators that he had heard a man named Jason Seawright talking about being involved in Grammer’s death but didn’t believe him until he came across a three of spades featuring a synopsis of the case. Seawright was ultimately convicted and sentenced to 12 years in prison. Why do the cards work? Michael Sullivan, the chief inspector in the Connecticut Office of the Chief State’s Attorney, who is currently readying the fourth edition of the state’s cold-case deck, said it all comes down to loose lips and boredom: Inmates brag to one another about their past exploits, and when the people they brag to come across cards that match stories they’ve heard, they realize they have information that could be worth money or could help them get time knocked off their prison terms. The use of cold-case cards is becoming more common. In the past year or so, they’ve been introduced in Idaho, Alabama, Ohio, and Colorado. Sullivan said that in recent years he has fielded calls from law enforcement agencies all over the country, as well as the Netherlands and Australia, who are interested in how the system works so they can develop their own.